A:Yes, we recommend preregistering for any class you plan to take. When should I arrive to class? A: At least 10 minutes before class, to sign waivers and keep your preregistered spot. A: Comfortable work-out clothing, preferably made from a material that is breathable. Most people wear leggings and a tank top. We do not require grippy socks. I've never taken a yoga or barre class before. Is there a beginner class? A: We welcome students of all ages and levels! 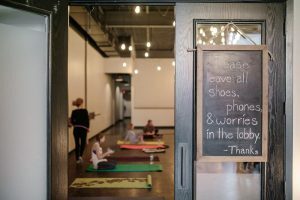 All of our yoga and barre classes offer modifications and challenges so that you can go at your own pace. Please let our instructors know if you have any injuries. A: Some water and a hand towel if you want one. We provide a few mats. I would like to purchase a gift card, how can I do this? A: We would be happy to help you with any gift card purchases at the studio or online. We have a 100% no refund policy. Preregistration is not required, however recommended for our busiest class times. If you cannot make it to your scheduled class, please cancel at least 4 hours in advance via your online account. and those on the wait-list can be notified in time to roll out their mats! You can cancel your reservation via your account up to 4 hours prior to the start of class. time) result in the class being returned to your account to be used at a future date. class and you will be charged as attending. We understand emergencies happen; email us in case of extenuating circumstances. There is a 100% no refunds or transfers for all gift cards and memberships. All memberships must be cancelled 2 weeks before the designated expiration date.